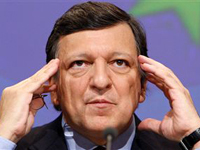 The European Parliament on Tuesday approved of the new team of EU commission chief Jose Manuel Barroso who urged governments to tone up the fight against the economic crisis. European deputies backed the "Barroso II" team by an overwhelming vote of 488 to 137 in support of the new European commissioners. There were 72 abstentions. Barroso has been waiting for the parliament's vote since October when his first term ended. Delays in ratifying the bloc's Lisbon reform treaty and parliament's rejection of the Bulgarian nominee for EU humanitarian aid commissioner, kept Barroso as a caretaker leader of the powerful EU executive body which proposes new laws, polices treaties, oversees competition issues and supervises enlargement. "The urgent problems require urgent action, my team is ready," Barroso said. He called for closer coordination by the 27 EU member states to assure economic recovery. Often criticised during his first term for a lack of swift action when needed former Portuguese prime minister Barroso promised "short-term measures to put Europe back to work," and to stimulate economic growth. The vote in favour of the new EU executive team was made possible after Bulgaria put up respected World Bank vice-president Kristalina Georgieva as its replacement candidate for humanitarian aid commissioner following the debacle over Rumiana Jeleva, who also had to resign as her nation's foreign minister. Each commissioner, picked by the European capitals, had to undergo a three-hour parliamentary hearing. Criticised for failing to act quickly enough to address fallout from the financial crisis and recession, relaunching the economy is a main concern for Barroso and his core economic team -- the EU's Spanish competition commissioner Joaquin Almunia, its Finnish economic affairs commissioner Olli Rehn and Michel Barnier of France who becomes internal market commissioner. Other members of Barroso's new team include Belgian Karel De Gucht, who picks up the trade portfolio, and Romanian Dacian Ciolos at agriculture. The former Portuguese premier vowed to "spend the next five years turning our vision into reality: making Europe a resource efficient, inclusive, social market economy -- reflecting what makes us special, the European way of life."